1275 Minnesota St. San Francisco 94107. Gallery hours for installation are 11a-4p, tu-sat. 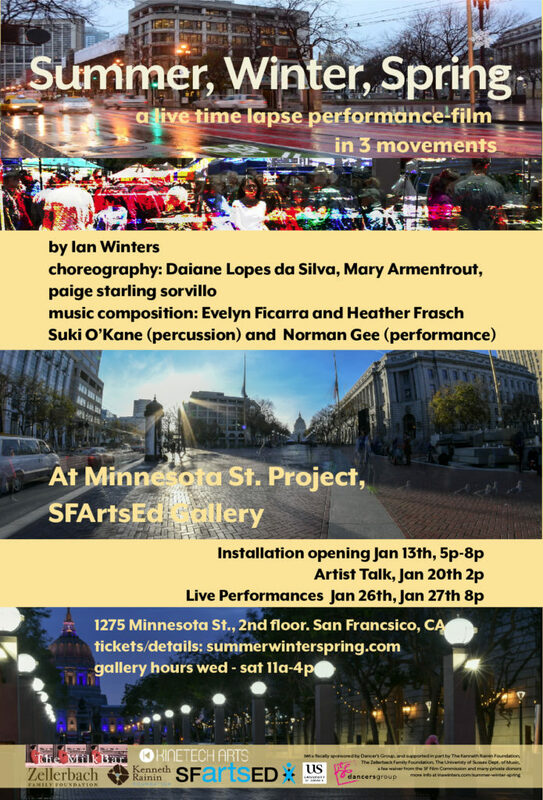 Summer, Winter, Spring is a live film and time-lapse performance in three movements which explores the radically varying physical rhythms and seasons of San Francisco’s UN Plaza and mid-Market street corridor through a combined film, performance and live music score created using 2 years of time-lapse performances in UN Plaza. Led by media artist Ian Winters, it combines a video & sound installation that opens Jan 13th and runs through Jan 27th, 2018 with a live performance on Friday Jan. 26th, and Sat Jan 27th at 8pm. 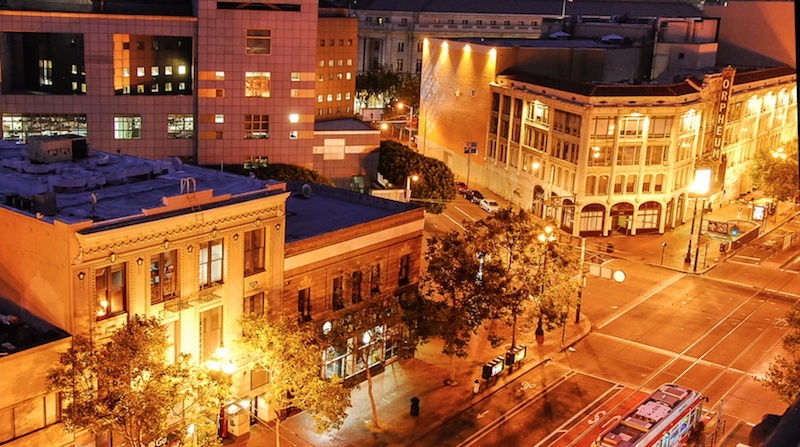 Both explore the radically varying human and natural rhythms of UN Plaza and the mid-market street corridor of San Francisco in a series of 3 movements based on respective seasons. 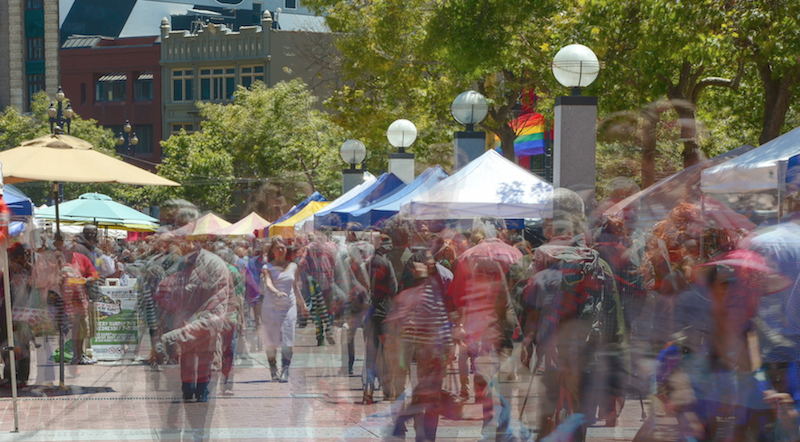 In addition to aesthetic aims, Summer, Winter, Spring witnesses the deeply contested public space of San Francisco’s UN Plaza – which embodies many of the fault lines running through our current social, economic and political landscape. In addition to Winters, other key artists and collaborators include choreographers Daiane Lopes da Silva (Kinetech Arts), paige starling sorvillo (blindsight), Mary Armentrout (Milkbar) and composers Heather Frasch and Evelyn Ficarra along with live percussion by Suki O’Kane and additional performance by Norman Gee, plus many guest performers in the films. 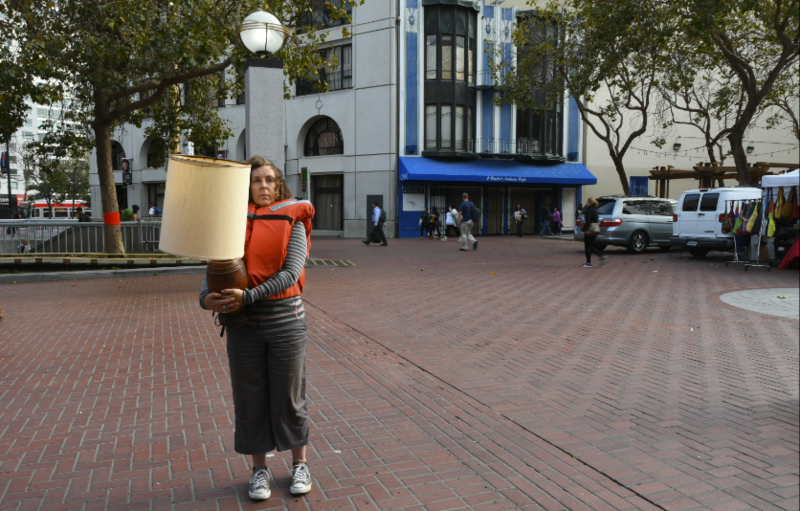 The project premieres at the SFartsEd Gallery in the Minnesota Street Project at 1275 Minnesota St., San Francisco. live performances at 8pm on Jan 26th and Jan 27th, 2018. Tickets for the performances on Fri. Jan. 26th and Sat. Jan. 27th are $25 via eventbrite with a NOTA policy. The artist talk and reception are free and open to the public. For more about the collaborating artists. For more information about the project contact Ian Winters. The gallery exhibit and performance of Summer, Winter, Spring has been generously supported in part by the Rainin Foundation, the Zellerbach Family Foundation, the SF Film Commission fee waiver program, The University of Sussex, and private donors, hosted by the SFArtsEd Gallery at Minnesota St. Project, developed by the MilkBar and Kinetech Arts and is fiscally sponsored by Dancers Group. A few stills from our shooting over the year : Summer, Winter and Summer again.